Here are some typical questions that we get from people. Q: Why do I need the EMIS Tube®? A: The EMIS Tube® can save your life by quickly providing critical medical information and history to emergency personnel and first responders during a medical emergency – when every second counts. Most people don’t realize that during the confusion of a medical emergency, the emotional distress on family members at the scene can render even the most composed person unable to remember critical information when it is needed the most. This “emergency paralysis” has been known to affect a significant number of people witnessing a serious medical emergency. Who would speak for you or a family member rendered unconscious in an automobile accident? Who would know your children’s medical information if a medical emergency happened to them while away at school and first responders couldn’t reach you quickly? Would the babysitter or caregiver know your child’s medical information? Who would know your medical information if you are away from home and disaster struck? The EMIS Tube® can quickly and effectively provide this medical information in the event of an emergency. Q: My medical information is kept on file at my doctor’s office or at my children’s school, so why would I need the EMIS Tube®? A: during a medical emergency, when critical seconds count, it is unlikely the first responders will have the time or the contact information to be able to access any medical information kept on file. Additionally, due to very restrictive HIPAA (the federal Health Insurance Portability and Accountability Act) laws, it is doubtful that even if responders were able to make contact with your doctor or your child’s school nurse, that the doctor or nurse would legally be able to provide the information necessary over the phone. Q: Neither my family nor I have any medical issues, why would I need the EMIS Tube®? A: Standard emergency medical procedures have been written with the assumption that no medical information about the patient is known. These procedures have been designed to look for the possibility of a number of different causes for the emergency, including pre-existing conditions. Without knowing a patient’s medical information, first responders must assume that the patient could have a pre-existing condition or could be on medication, so their actions taken need to be very generic to avoid possibly harming the patient more. If emergency personnel knew that the patient had no pre-existing conditions, or was not on any specific medication, they could more aggressively treat the patient. The time saved could make all the difference. Q: What is so special about the EMIS Tube®? A: The EMIS Tube®, which was designed by a veteran Emergency Medical Technician (EMT), contains very detailed medical information forms which when filled out completely, provides first responders with the majority of information necessary to quickly and accurately treat the patient, saving critical time. The tube—along with the decals, magnet, tags and the forms inside—were purposely created to be bright orange so that they can be found quickly in an emergency situation. The trademarked EMIS Tube® logo, displayed on the stickers, magnets and tags, contains the blue “Star of Life” insignia, which medical professionals are trained to look for. Even if a first responder didn’t know about the EMIS Tube®, these markings would signal that it is a medical device—something that they should look for. The combination of the bright orange color, the Star of Life insignia incorporated into the logo, along with the notification on the sticker, magnet or tag of where the EMIS Tube® is located, create a powerful tool. 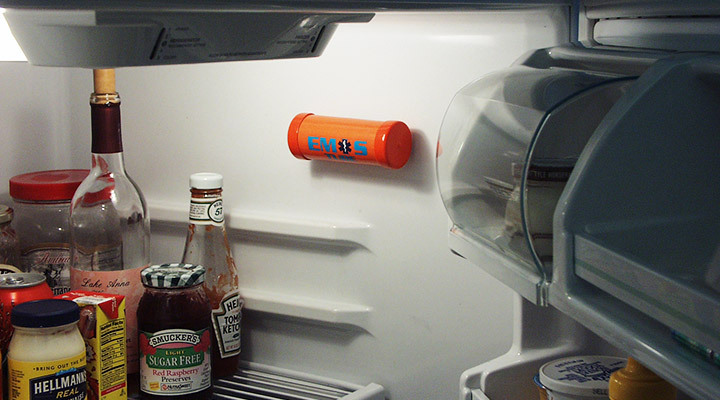 Q: Why does the EMIS Tube® home model go in the refrigerator? A: The EMIS Tube® home model is designed to be kept in the refrigerator because most homes typically only have one refrigerator, and first responders can easily find it in the kitchen. The tube comes with Velcro tape which allows the tube to be placed on the top inside wall of the refrigerator where is easily accessible to first responders, but remains out of the way. This is important because without the Velcro tape to keep the tube in place, chances are that within a few days the tube would get lost behind the refrigerator’s contents, and become useless. Also, in the event of a fire, the refrigerator is usually the last to burn due to its insulation. Q: What other commitments are necessary when I buy the EMIS Tube®? A: Once purchased, there are no further commitments or costs to maintain the EMIS Tube® other than making sure the information on the forms is complete, accurate, and up-to-date. It is strongly encouraged that the forms be filled out in pencil so they can easily be updated when necessary. Q: Are there other products available like the EMIS Tube®? A: The EMIS Tube® is the premier Emergency Medical Information System product on the market. Although there other products available that can relay medical information in the event of emergency, the each have significant drawbacks. Higher-tech products, such as USB flash drive and credit card-type mechanisms, require the first responders carry the devices necessary to read these products (which they usually don’t), and that the software is compatible. Medical information programs kept on smart phones seem like a good idea, but recent surveys have found that the majority of people are concerned about keeping their personal medical information on a device which can easily be stolen. Furthermore, first responders are not trained to look for medical information contained on cell phones. Some communities have offered products designed to convey medical information in case of emergency, but these products are not widely available, nor do they contain standardized medical information forms or notification logos, making them more difficult to identify and use. In addition, these products tend to use a generic refrigerator sticker and small empty pill vials to contain the medical information, making them useful only at home, and difficult to find an emergency. Q: How can the EMIS Tube® help raise money for my organization? 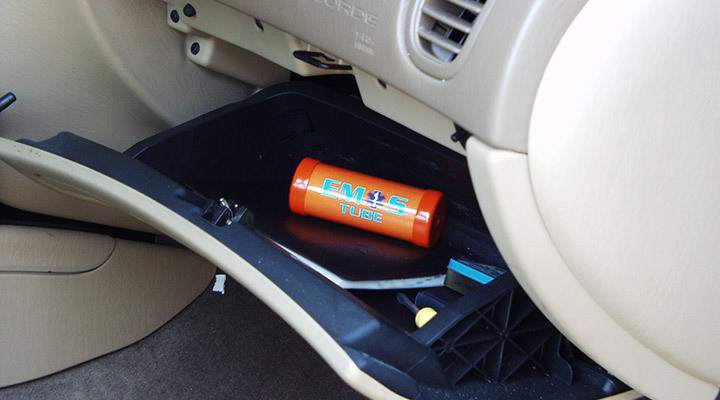 A: The EMIS Tube® is a public safety product like no other on the market. Because of its purpose, specifically designed to help save lives, using the EMIS Tube® as a fundraiser not only raises much-needed funds, but demonstrates your organization’s social commitment to protecting the safety of your community. Using the EMIS Tube® as a fundraiser, your organization can generate significant revenue without upfront costs or commitments. Since sales of the EMIS Tube® can be done on either an order or consignment basis, there are no upfront costs required (other than shipping on consignment contracts).